During our nonfiction unit, students still read their fiction chapter books so I have students meet with their partners in the middle of reading workshop, instead of at the end, to clearly split up the nonfiction and fiction reading. 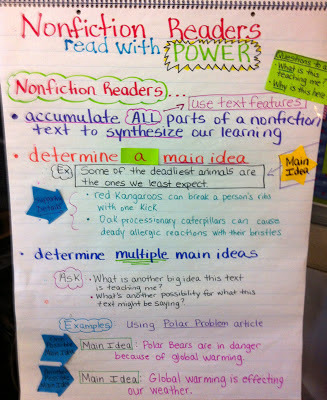 For example, after the mini-lesson, students go off to read their nonfiction texts. After about 15-20 minutes, I pause them for a mid-workshop teaching point that leads them into their partner conversations. In our classroom, we have Partner 1 and Partner 2 identified in partnerships so each day I alternate between having one of the partners do the teaching, while the other actively listens and asks questions to deepen their understanding and thinking. 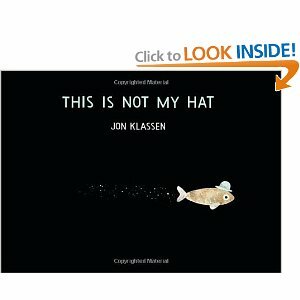 After talking for about 5 minutes, I have students end their conversations and switch to their fiction reading. During this unit, some partnerships have chosen to read nonfiction texts on the same topic or the same text, while some have chosen to read texts on different topics, but read the same fiction chapter book. the post-its they used to mark important places in the text. I have modeled how to use the text and notes during a conversation to actively involve and teach their partner as well as how to be an active listener and ask questions to deepen your partner's thinking and learning. We also have numerous fishbowl conversations, where partnerships model a conversation in the middle of a circle and we listen, watch, and notice what they are doing to have a powerful conversation. This helps students see what a successful conversation looks like and the visual helps them be able to try out those conversational moves and strategies in their own conversations. 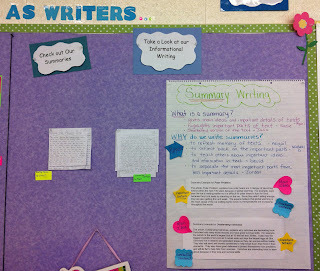 In a recent post, I wrote about developing independence for student writers. One of Teacher's College staff developers, Emily Smith, had used independence and repertoire in a sentence together and I have loved thinking about the two terms together. Melanie Swider wrote a post earlier this year about writing backpacks, emphasizing the fact that students need to have writing territories. If a child is a soccer player, chances are he/she has narrative, persuasive, and informational ways to write about soccer. If he/she has a sibling, there are probably several writing opportunities across the three genres. So many times, we hear that students have nothing to write about. 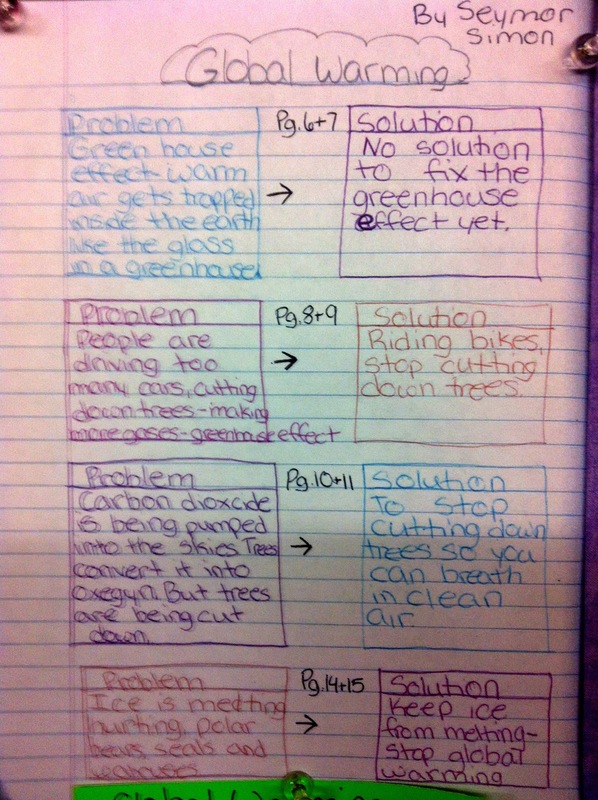 Developing notebook pages of writing topics offers students an increased repertoire of what to write about, a part of the writing process that can really muddle students. I created this chart as an example of how we can teach students the repertoire that they don't always know that they have. 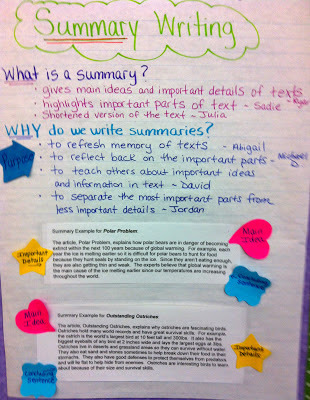 When students understand that thesis is to essay as heart/climax is to narrative, their sense of repertoire develops. Just as their essay should weave in ideas and evidence that support a central idea or claim, their narratives should drive the central plot. The more that they understand the purpose, the more they develop this key skill of their repertoires. 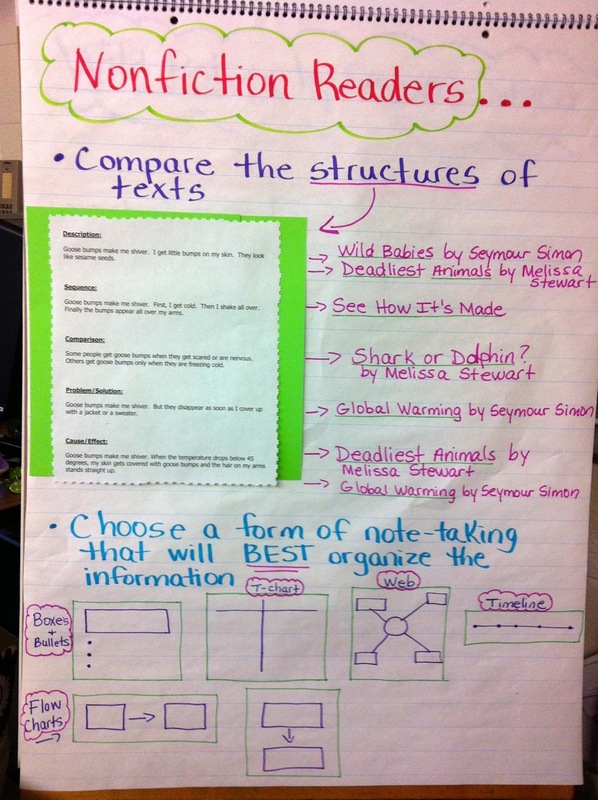 Again, we should be developing elaboration skills across genres as closely related entities. If a student can use quotes and conversation in narrative, then he/she should have that skill available for argumentative and informational writing. If a student has learned how to capture and ground readers with strong narrative beginnings, that skill should show up in other genres. The list goes on, but the idea stays the same. The more that we can teach students that conventions and grammar exist in ALL types of writing, regardless of the content area, the more that they develop these skills and the repertoire to use them. If we teach them that spelling, conventions, and grammar offer power to writers, then students are more likely to develop mastery of these skills and strategies, developing an increasingly sophisticated repertoire of how to express themselves. The more that students can take a step back and understand that the skills they learn in one unit apply to all of the units, the more that they build repertoires for themselves. 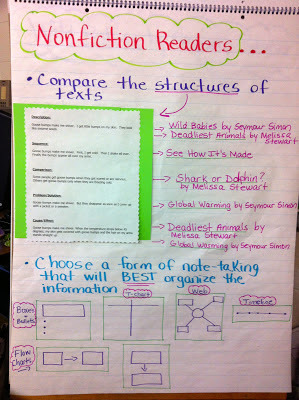 One other chart that I have designed was with the Common Core in front of me, thinking about the sub-skills for each type of writing. It's easy to see the repetition of the skills as you look across the rows so it can become clearer to students how to apply skills that they have learned across genres of writing. More than anything, thinking about repertoire reminds me that students learn more powerfully when they understand the "whys" behind their learning. Happy learning, teaching and writing! 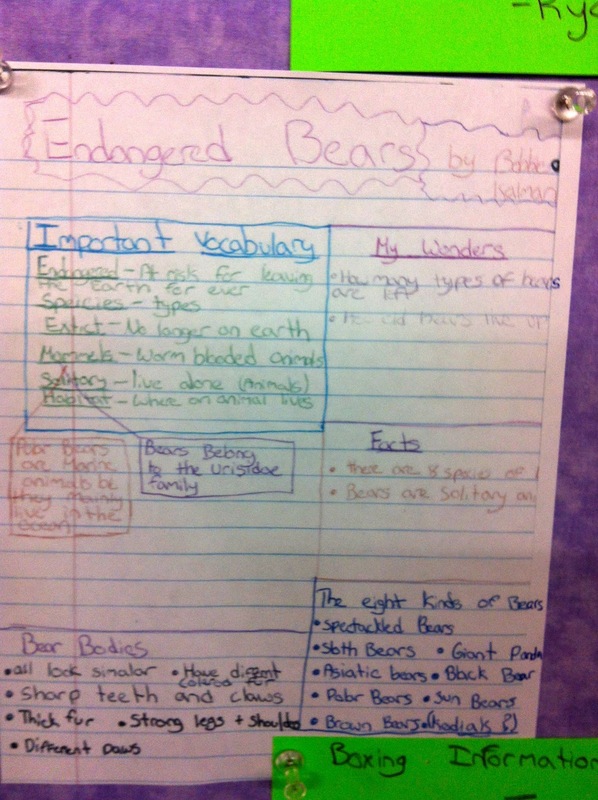 This is the 2nd post in a series of posts about our Nonfiction Unit. To read my first post, please click here. In my previous post, I shared a photo of our class bulletin board where students post note-taking examples that their classmates can use as mentors. 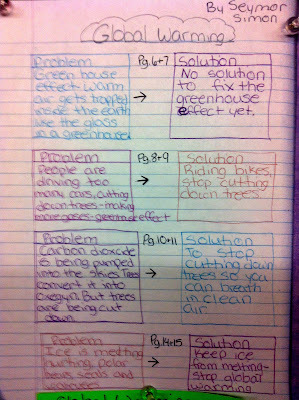 Below are a few close-ups of some note-taking examples that students have posted so far. These are the forms of note-taking that students chose to use while reading their text during independent reading or while actively listening during read aloud. 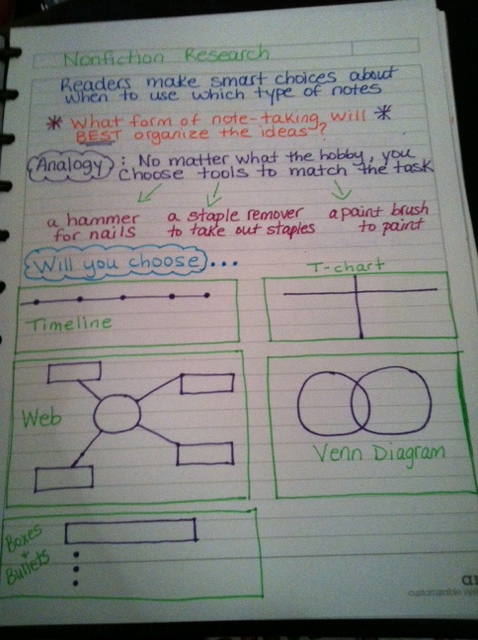 I taught and modeled various note-taking strategies and we have practiced how to choose a form of note-taking that best organizes the information. We learned that note-taking is a tool and that we need to choose the best tool to match the text we are reading, just like we choose a hammer to put a nail into a wall or a staple remover to remove a staple in papers. As students use different forms of note-taking, they are posting them on our bulletin board and sharing their reasoning behind using the form they chose. They are learning from one another and using each other as mentors - such powerful learning! You will notice that students use colored pencils while they take notes - this not only gives them the ability to color-code, but also inspires them to take notes and write in their notebooks! 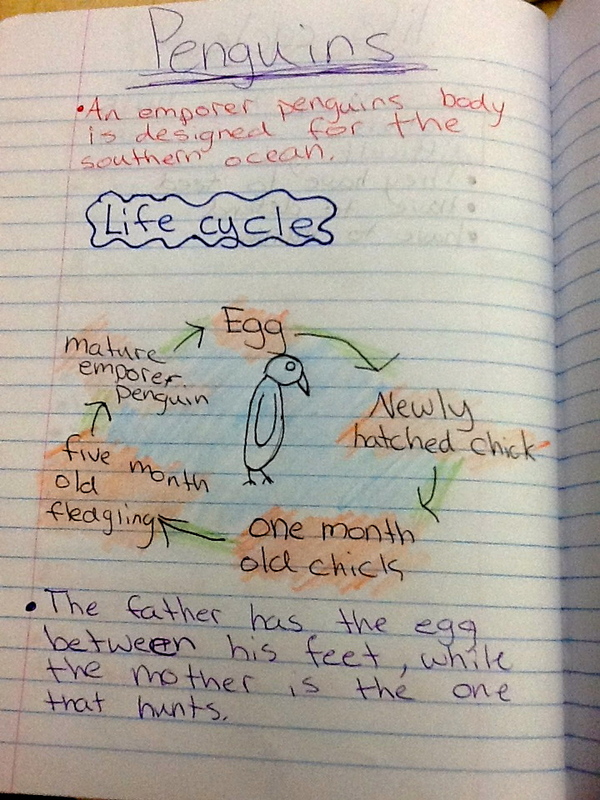 They use colored pencils throughout their reader's notebook, not just for note-taking in our nonfiction unit, but throughout all units and all sections of their reader's notebook. As is frequently the case, I went to the bookstore to find a couple of specific titles and they did not haven them...However, since I had an hour to use up before having to pick up a daughter, I found many other books to read and enjoy. Penguin and Pinecone by Salina Yoon is an adorable book about a penguin befriending a pinecone. A somewhat unlikely relationship, I know, but one that could inspire classroom conversations about good friends and even some habitat and agricultural lessons. My No, No, No Day by Rebecca Patterson reminded me a lot of Harriet, You'll Drive Me Wild by Mem Fox or Alexander and the Terrible, Horrible, No-Good, Very Bad Day by Judith Viorst. It's another good title for showing students that if they must write a bed-to-bed story, they really need to establish a unifying strand. In this case, the main character's day got worse and worse because of situations that most young children can understand! Charley's First Night by Amy Hest is a cute book about a puppy's first night in a new house. Since MANY of the on-demand personal narratives I read had to do with getting a new puppy, this might be one to pull out during next year's Personal Narrative unit. The last one I'm sharing tonight (although I did read several more!) 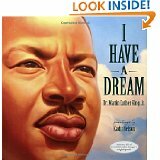 is I Have a Dream, a picture book of Martin Luther King's speech with amazing paintings by Kadir Nelson. 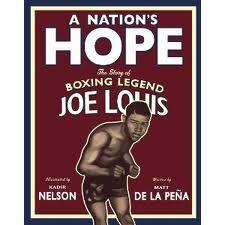 I would use this book to honor Martin Luther King, but I would also use it to teach principles of persuasive writing. What an amazing speech to read and re-read, as well as listen to since this book comes with a CD, as well! Have a wonderful Thanksgiving, everyone, and Happy Reading! When I was talking to one of our Teacher's College staff developer, Emily Smith, she talked about building independence and repertoire for students as they work through the writing process. Since then, I have been thinking about what that means for all genres at all levels. What are the tools that students have that help them build independence, confidence and skill? What are the tools that we can offer students that help them to understand the skills that they acquire and the pathways that exist for generalization? Although I at first envisioned this post as a single one, I have decided to break it into two parts; the first part is about tools for independence and the second part will be about building repertoire for students. 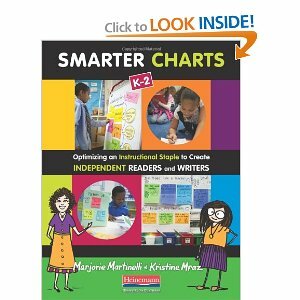 Kristi Mraz and Marjorie Martinelli who are the authors of Smarter Charts wrote a great guest blog post at twowritingteachers.wordpress.com. If you missed this post, I highly recommend reading it because they write all about how to create, use, and retire charts in classrooms. For me, I think that charts increase accountability for students. 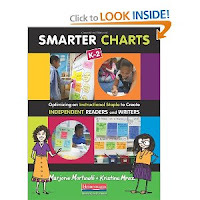 If students participate in the creation of the chart, have daily access to it while doing their work, and understand that the charts have answers to frequently asked questions, then students learn that these charts build independence. The charts are a step along the path of gradual release. 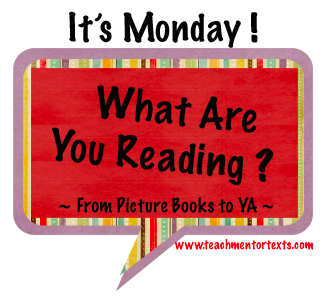 Another powerful post I recently read is on the blog, To Make a Prairie by Vicki Vinton. Thinking about some of what Vicki wrote makes me really want to see students involved in the development of charts and also moving in the direction of not needing the charts. While I love to see charts evolve, remind and inspire children, I also love to see them retire as students become independent. 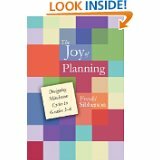 I am looking forward to the release of the new units of study from Lucy Calkins and Heinemann Press due out in March 2013 because I know that one of the emphases will be on students setting goals for themselves. When Emily visited our fifth-graders in October, she taught students about checklists that they can use during their writing process; they could use these checklists not only to evaluate their work in progress, but also to set goals for themselves. Many of our students have continued to use the checklists and monitor their goals. I think that it is SO important for students to learn to set goals for themselves because by doing so, they take ownership of their learning and they build independence. Mentor texts are my favorite teaching tool and I think that the more we can get students to recognize craft moves, the more that we can get students to use those craft moves in their own writing. As a writer, I can't tell you how many times I have heard that the best way to improve my writing is to read. And read. And read. When we model to students how to study craft moves and writing impact, mentor texts become important tools for students to build Independence. That old saying about teaching a man to fish comes to my mind whenever I think of writing partners. It's a lot of work to teach students how to be effective partners. They have to learn their roles, how to listen, how to recognize and evaluate good writing, and how to give meaningful feedback. However, how useful partnerships can be for busy teachers! If the goal is to lift the level of student work and we can get students to help us do that, what amazing independence we are building in our classrooms! I'm saving the most important tool for building independence for last...the more that we can teach students that their notebook is a source for topics, revision, strategies, quotes, characters, conversations, and many other lessons we teach, the more independently students will cycle through the writing process in all genres. As an elementary coach of several grades, I love the all encompassing aspect of independence and repertoire. Students build both during and throughout grades and the more that we explicitly teach these skills, the better for students as learners. "Your job, students, is to take these skills that I teach you and apply them to all types of your writing on your own, without me." What an important message to send to all students of all grades and levels. The second part of this post will be about building repertoire for students and I'd love to hear about other ways that you are teaching independence and repertoire to your students. Please feel free to share in the comments. This month, we began our nonfiction unit in reading workshop and have been learning new skills and strategies as nonfiction readers. This is the first post in a series of posts I will be writing about nonfiction. 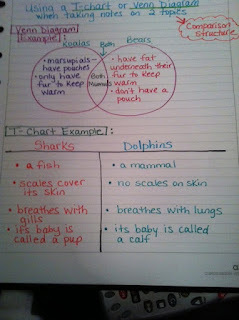 Below are two of my charts that identify the teaching points of my minilessons so far in this unit. Each day, I add the teaching point onto the chart and give examples from my demonstration and the students' examples from their turn and talks/stop and jots. I then hang up the charts above our meeting area so we can consistently refer to what we have learned and how we are building onto our learning. I do this type of charting for each unit of study. Last week, we worked on first determining a main idea of a text and supporting it with specific details from the text and then moved into determining multiple main ideas for one text. 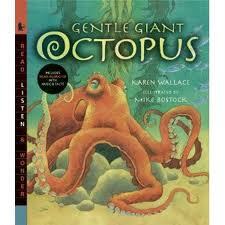 The students have enjoyed delving deeper into nonfiction texts by asking, What is another big idea this text is teaching me? What's another possiblility for what this text might be saying? This week, we have been working on choosing a form of note-taking that best matches the text structure and will best organize the information we are learning. For example, when reading a text that is comparing two topics, we can use a t-chart or venn diagram; when reading a text that is describing one topic, we can use boxes and bullets or a web; when reading a text with sequence structure, we can create a timeline; and so on. 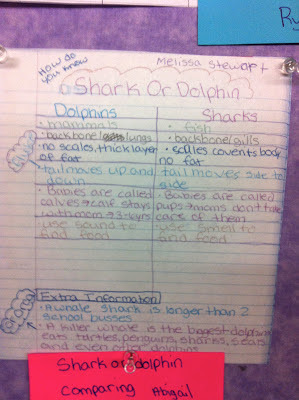 I have also created pages in my sketchbook that I use for mini lessons, conferring, and small groups, that support this important note-taking work we are doing as nonfiction readers. Below are some examples from my sketchbook. In our classroom, we have created a bulletin board that is dedicated to highlighting student examples of note-taking while reading nonfiction texts. 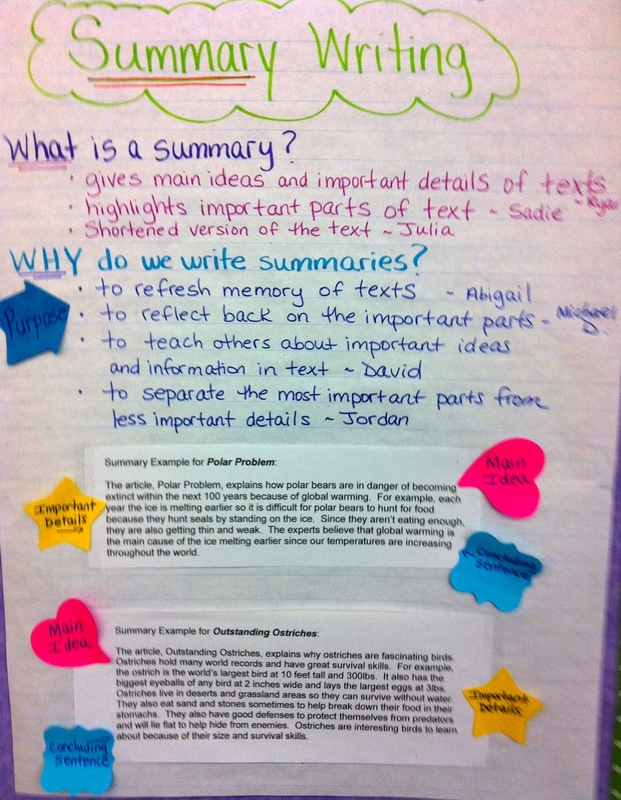 Our bulletin board is divided into sections based on various text structures and note-taking forms. 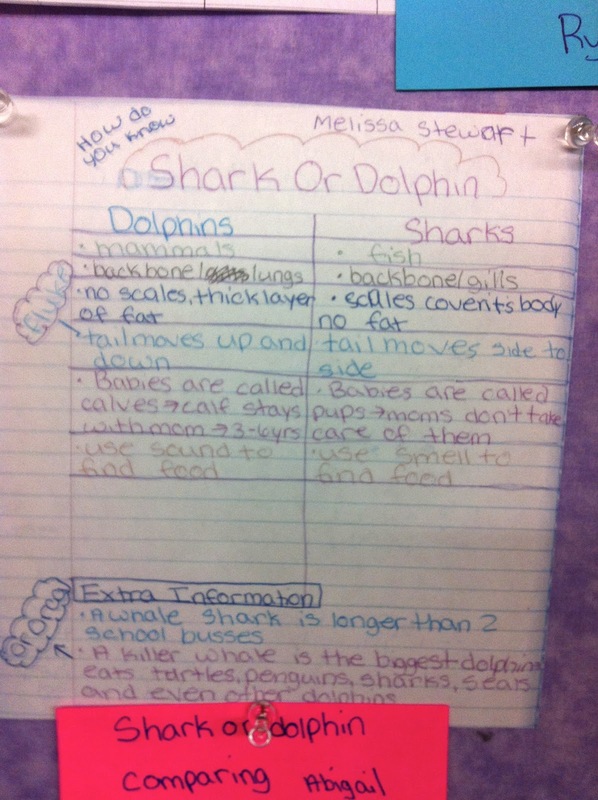 Students post their examples for their classmates to use as mentors as they explore and try out using different forms of note-taking. I hesitated to explore Pinterest for various reasons. I didn't understand it. (Disclaimer: I still don't understand parts of it.) I was spending enough time on Flipboard reading posts and twitter feeds. I had a pile of books that I wanted to read. Jessica Johnson, who is one my favorite people to follow, wrote a post about Pinterest over the summer and I put it on my mental to-do list, but I really didn't explore it until a few weeks ago. I waited too long. As an instructional coach, I am always looking for ideas to share with teachers and there are infinite ideas for sharing on Pinterest. People create "boards" out of pictures or images from the internet and the boards can be of any topic. You can search by topic, by person, or by subject to find pins; one great pin leads to another leads to another leads to a great new blog leads to a great new website. You can find "pinners" who you especially like and follow them. For me, I have been using it to organize the charts that I create and see so that I can use them as coaching tools. I have started boards for various grades for specific units and genres. 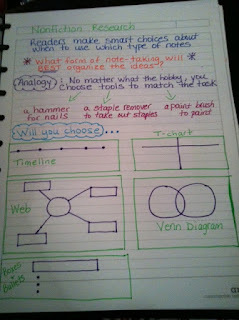 While I keep a traditional paper notebook of charts, Pinterest lets me manage and develop a digital chart collection. I'm trying to manage my Pinterest fetish so for now, I am limiting myself to only literacy boards, but I'm sure that in due time, I will expand my board topics into other areas of my life. If you haven't dabbled in Pinterest, I highly recommend it as a limitless way to find inspiring lessons and ideas for your classrooms and any other aspect of life that you want to explore. This is one of the many titles in her "How Do You Know?" series that includes topics such as: Butterfly or Moth? ; Frog or Toad? ; Insect or Spider? ; and so on. 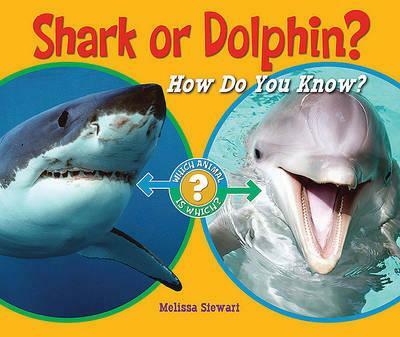 This series is perfect for teaching students how to read nonfiction texts written in a "Comparison Structure." They are also great texts to model note-taking strategies, such as a T-chart or venn diagram, when reading a text that compares two different topics. 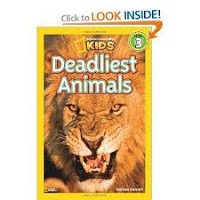 This book engages the reader right from the introduction by surprising the reader that the African Lion is not actually the deadliest animal after all and there are many surprising deadly animals. 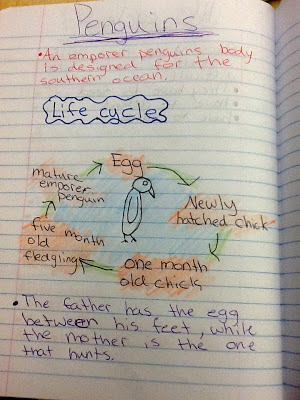 Each page focuses on a different animal which lends itself perfectly to teaching students how to identify a main idea and support it with details. Students are definitely going to love listening to the amazing facts about these deadly animals and looking at the detailed photos. I have always loved the National Geographic Readers and was pleasantly surprised to find out that Melissa Stewart is the author of a few books in the series. 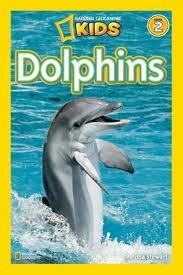 Dolphins is a high interest book with great text features. There is not a lot of print on each page and the print is large so it is easy to read. The National Geographic Readers series has books on a variety of topics, levels, and written by different authors. Thursday is the day that we dedicate to technology. Twitter is a resource I use all of the time to connect with other educators and share ideas. Last night, I participated in a twitter chat about workshop instruction and the Common Core State Standards. Kellee Moye and Mindi Rench facilitate the monthly reading and writing workshop twitter chat every first Wednesday at 9pm ET. If you're not on twitter, this might be worth taking the plunge. Kellee and Mindi posed questions throughout the hour and I am sharing the questions and some of the answers. If you want to read more about it, you can visit the archive at http://rwworkshop.wikispaces.com/. I had never visited this wikispace until tonight and believe me, a person could spend A LOT of time there--enter at your own risk! Question: How do we keep the love of literature/reading while still being as rigorous as the standards? I think that we all agreed that workshop instruction involves constant and continuous assessment so that we differentiate our lessons, conferences, and small group instruction. Assessment is not exclusively for accountability; it is to also to check for understanding and guide instruction. Question: What part will poetry play in #rwworkshop as we transition to #CCSS? was one of my favorite tweets of the conversation. Another common belief is that poetry offers pathways to the common core because poetry can be within any of the three genres--informational, narrative, or persuasive. Poetry also offers strong opportunities to teach students about figures of speech, skills that are embedded in the standards and it offers struggling readers opportunities to read and re-read, increasing and improving fluency. Question: How will technology play a role in workshop and #CCSS? These were only three of the many tweets about technology and the CCSS. Many of the others reflected the belief that educators should be embedding technology into our daily practices and facilitating students’ explorations of it whenever possible. These practices will increase the rigor in classrooms and serve as clear pathways for students to meet the expectations of the CCSS. Conversations about the reading and writing workshop continue throughout the month because people use the hashtag. #rwworkshop. Anyone is welcome to "listen" or "chat." Comments and tweets are always welcome! Over the weekend, I was preparing for our district's professional development day tomorrow. Since I will be facilitating the new Opinion Unit for our second-grade teachers, my eight-year old nephew and I read several books and worked on finding places where we could make evidence-based statements. We had fun! These books are not new books for me, but the thinking and pushing for evidence with a second-grader was new to me. We read Harriet, My Darling Child, You'll Drive Me Wild by Mem Fox to debate whether Harriet's mother over-reacted. (Jack didn't think so, but I did!) If you missed Harriet when she was first published, I highly recommend this book for teaching focus and for encouraging debate. 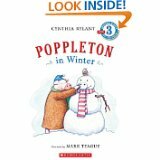 We also read Poppleton in Winter by Cynthia Rylant and debated whether Cherry Sue was self-serving or a good friend. Who knew there would be so much text evidence to support either theory??? 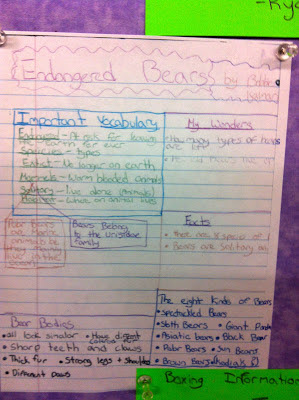 We also created a chart of supporting and refuting text evidence for the statement that Poppleton was a creative pig. The mother had an unhappier childhood than the daughter. The boy was a good enough friend to the tree. Koala Lou should not have participated in the olympics. I'm looking forward to continuing this thinking with our teachers tomorrow and if anyone has more to contribute, by all means! Happy reading! What is This Really, REALLY About?